Instagram is clearly the place to be for influencer marketing in 2019. As we saw in our The State of Influencer Marketing 2019: Benchmark Report, Instagram usage has grown 10x over the last five years. It exceeded 1 billion daily users in June 2018 and is rapidly on its way to a second billion. 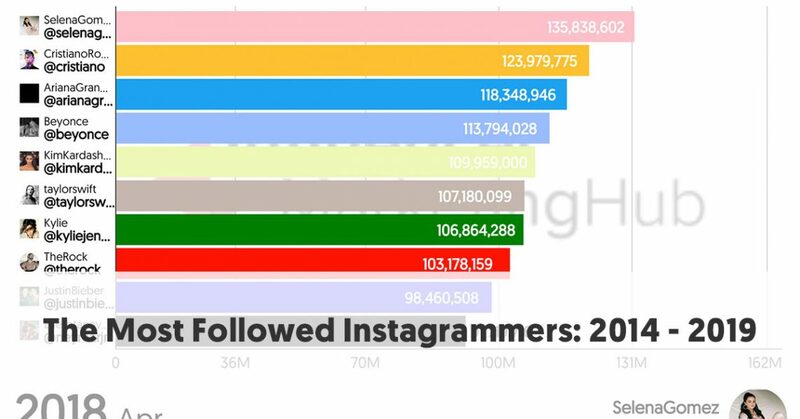 But who are the greatest Instagram influencers in 2019? While we can’ tell the exact amount of influence that each of these accounts has, we list the 25 accounts with the most followers. Alright, this top account seems almost like a cheat – the top influencer on Instagram is … Instagram. It probably isn’t an influencer account, as such, but nonetheless, it is still the most popular account on the social network. In many ways, Instagram uses this account as a demonstration account, where they show off the capabilities of Instagram. Many of the photos they upload are quirky and interesting. They generate huge numbers of likes and comments. Of course, as an Instagram showcase, this is not a true influencer account, and it is most unlikely to be interested in any influencer marketing deal. Any football follower will instantly recognize the name of Cristiano Ronaldo. Ronaldo is a Portuguese professional footballer who plays as a forward for Italian club Juventus and captains the Portugal national team. For many years people considered him to be the greatest player in the world, and many still regard him as one of the greatest players of all time. As with most professional sportsmen, he may well be interested in a sponsorship deal – for a substantial price. Ariana Grande is an American singer, songwriter, and actress. She began her career in 2008 in the Broadway musical 13. She made her first musical appearance on the soundtrack for Nickelodeon series Victorious (in which she acted) and was signed to Republic Records in 2011. Grande released her debut album, Yours Truly in 2013. She is the first artist to have the lead singles from each of their first five studio albums debut within the top-ten on the US charts. She has tasted much success and won one Grammy Award, one BRIT Award, three American Music Awards, three MTV Europe Music Awards and two MTV Video Music Awards. Billboard named her Woman of the Year in 2018. Selena Gomez (is an American singer, actress, and producer. She first gained recognition in children’s television – in Barney & Friends and then in Disney’s Wizards of Waverly Place. She initially gained musical success with the band, Selena Gomez & the Scene, with three albums making the US Billboard 200. She has continued with solo success, earning seven top-ten entries on the US Billboard Hot 100. In 2017, Billboard reported that she had sold over 7 million albums and 22 million singles worldwide. Gomez has continued to mix in acting with her music career and has appeared in multiple movies, as well as her music videos. She was the most followed Instagrammer in the world before being surpassed by footballer Cristiano Ronaldo in late October 2018, ignoring the Instagram demonstration account. Although best known for his acting nowadays, Dwayne Johnson initially used the name, The Rock, as a professional wrestler. He began training as a professional wrestler in the summer of 1995. The following year The Rock signed with the WWE (then known as the World Wrestling Federation - WWF). He won his first WWF Championship in 1998. He took a seven-year hiatus from WWE from 2004-2011, returning part-time until 2013. It was during Johnson’s wrestling hiatus that he moved into acting, producing, and writing. He has played the leading role in numerous films. However, his most successful box office role is as Luke Hobbs in The Fast and the Furious franchise. Kim Kardashian is an American media personality, businesswoman, socialite, and model. She first gained media attention as a friend and stylist of Paris Hilton. Her most notable public exposure, however, has been in the reality television show featuring her family, Keeping Up with the Kardashians. She has actively worked her social accounts more than most people on this list and is also highly popular on Twitter. Kardashian has recognized the value of merchandising and has released numerous products bearing her name. Her relationship, followed by marriage, to rapper Kanye West received significant media coverage which added to her exposure. Kylie Jenner is another member of the Jenner-Kardashian clan. She is sister to Kendall Jenner, and half-sister to Kim Kardashian, Kourtney Kardashian, Khloe Kardashian, Rob Kardashian, Brandon Jenner, and Brody Jenner. With the rest of her family, Kylie featured in Keeping Up with the Kardashians. She is the founder and owner of cosmetic company Kylie Cosmetics. In 2014 and 2015, Time magazine listed the Jenner sisters amongst the most influential teens in the world. Beyoncé (Beyoncé Giselle Knowles-Carter in full) is an American singer, songwriter, actress, record producer, and dancer. She rose to fame in the late 1990s as lead singer of the R&B girl-group Destiny's Child - the group became one of the best-selling girl groups in history. Destiny’s Child broke up in 2006 and Beyoncé subsequently built a highly successful solo career. She has also acted in films such as Austin Powers in Goldmember, The Pink Panther, Dreamgirls, and Obsessed. Beyoncé has sold over 100 million records worldwide as a solo artist, and a further 60 million records with Destiny's Child. She has won 23 Grammy Awards and is the most nominated woman in the award's history. Taylor Swift is an American singer-songwriter. She is one of the best-selling music artists of all time, having sold more than 50 million albums, as well as 150 million single downloads. She is also an accomplished songwriter and was included in Rolling Stone's 100 Greatest Songwriters of All Time in 2015. She has also received 10 Grammys, one Emmy, 23 Billboard Music Awards, and 12 Country Music Association Awards. She even holds six Guinness World Records. She topped Forbes’ Celebrity 100 in 2016. Lionel Messi is an Argentine professional footballer who plays as a forward and captains both Spanish club Barcelona and the Argentina national team. Many consider him the best player in the world and some regard him as the greatest player of all time. He has spent his entire professional career with Barcelona, where he has won a club-record 32 trophies. Messi holds the records for most goals in La Liga and in Europe's top five leagues, as well as many other goal-scoring records. He has scored over 680 senior career goals for club and country. He announced his international retirement in 2016 but reversed his decision and led his country to qualify for the 2018 FIFA World Cup. In that tournament, he became the third Argentine after Diego Maradona and Gabriel Batistuta to score in three different World Cups. Neymar da Silva Santos Júnior aka Neymar Jr. is a Brazilian professional footballer who plays as a forward for French club Paris Saint-Germain and the Brazil national team. Kendall Jenner is part of the Jenner-Kardashian family that features in Keeping Up with the Kardashians. She is now a model, mainly thanks to her Instagram success. She has done multiple editorials and cover shoots for LOVE and international Vogue editions, walked for Victoria's Secret, and acts as a brand ambassador for Estée Lauder's ad campaigns. Justin Bieber is a Canadian singer-songwriter, who built up a massive following amongst teens and tweens. He affectionately calls his fans, “beliebers.” In 2016, he became the first artist to surpass 10 billion total video views on Vevo. The National Geographic Society began publishing its National Geographic Magazine in 1888. It features articles about science, geography, history, and world culture. Before long it gained a reputation for the quality of its photography. The magazine is published monthly, and additional map supplements are also included with subscriptions. It is still available in a print edition, but now also has an interactive online version. Despite the Barbie name on the profile, this is the Instagram page for Nicki Minaj, a Trinidadian-American rapper, singer, songwriter, actress, and model. Her rapping is distinctive for its fast flow and the use of alter egos and accents, primarily British cockney. She has received numerous accolades, including six American Music Awards, 11 BET Awards, four MTV Video Music Awards, four Billboard Music Awards, a Billboard Women in Music Rising Star Award, and 10 Grammy Awards nominations. Khloé Kardashian is an American media personality, socialite, model, businesswoman, and entrepreneur. She starred with her family in the reality television series, Keeping Up with the Kardashians. She is involved in the retail and fashion industries with her sisters Kourtney and Kim, launching several clothing collections and fragrances. Jennifer Lopez, commonly known as J Lo, is an American singer, actress, dancer, and producer. In 1997, she became the first Latin actress to earn over US$1 million for a film and established herself as the highest-paid Latin actress in Hollywood. She also entered the music industry, becoming the first woman to have a number one album and film in the same week in 2001. Miley Cyrus is the daughter of Billy Ray Cyrus. She came to fame playing the title character of Disney’s Hannah Montana. She moved into music, earning three number-one albums on the US Billboard 20. She has received nine top-ten entries on the US Billboard Hot 100. Nike is unusual in this list in that it is a brand with an influencer’s following. Most of its posts feature active and sporting people, many wearing the company’s products. Other brands must envy its ability to gain a million likes and nearly 40,000 comments on a single post. Katy Perry is an American singer, songwriter, and television judge. She has released many successful and well-known songs. She has received four Guinness World Records, five American Music Awards, a Brit Award, and a Juno Award. Kourtney Kardashian, like the rest of her family, starred in Keeping Up with the Kardashians. She is involved in the retail and fashion industries. She has recently reduced a new website called Poosh. Kevin Hart is an American comedian, actor, and producer. He regularly performs stand up comedy. He began comedy tours in 2009 with his act titled I'm a Grown Little Man, followed by Seriously Funny in 2010, Laugh at My Pain in 2011, and Let Me Explain in 2013. Demi Lovato s an American singer, songwriter, and actress. She is a pop, pop rock, and R&B artist. She has won an MTV Video Music Award, 13 Teen Choice Awards, five People's Choice Awards, an ALMA Award, and a Latin American Music Award. This is the official profile of Real Madrid C.F. (Real Madrid Club de Fútbol). Real Madrid is a Spanish professional football club based in Madrid. The club was estimated to be worth €3.47 billion ($4.1 billion) in 2018, and it was the highest-earning football club in the world, with annual revenue of €750.9 million in 2018. Badgalriri is the official Instagram account for Barbadian musician Rihanna. She is recognized as a pop icon. Rihanna is one of the world's best-selling music artists, with over 250 million records sold worldwide.